Last Thursday, we posted a video report of GamerMuscle re-visiting the British Virtual Reality Racing Club based in the south-east of England, where he had a one to one racing session with Max Peter Coates who is a semi-professional racing driver from North Yorkshire. During his visit to the VRRC, GamerMuscle also had the opportunity to check out the recently released HTC Vive Pro Virtual Reality headset. GM fired up Assetto Corsa to find out the difference between this new HTC Vive Pro and the Oculus Rift and original Vive. 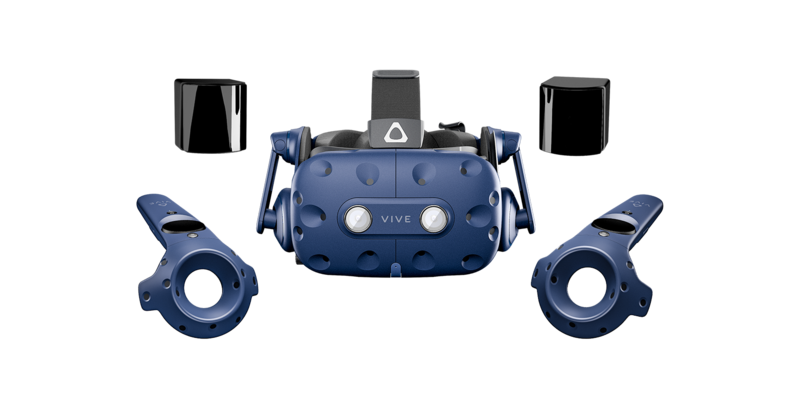 The HTC Vive Pro is the second generation of HTC Vive VR gaming headsets, that have mostly worked out some of the initial issues. The resolution has been increased even more to 2880×1600 (1,440p per eye), making games even more detailed. Together with the decreased light bleed, this ensures improved immersion. The comfort has also been improved with a new adjustment system with a dial. This way, it’ll be easier for you to put on or adjust the Vive, and the weight of the headset is more balanced. The integrated microphones and headphones make an external headset redundant, which means that you’ll need fewer cables. The Vive Pro HMD which does not include controllers, base stations or VIVE wireless adapter is available for €879. The Vive Pro full kit including the Vive Pro Headset, 2 SteamVR 2.0 controllers, 2 SteamVR 2.0 base stations, Link box, Cables, chargers and accessories is available for €1,399. Graphics: NVIDIA® GeForce® GTX 970 or AMD Radeon ™ R9 290, equivalent or better.